Services on Ferny Grove Line are cancelled due to power fault. Service to resume by 4:00 PM. Alt. transport operating between Fort Valley and Ferny Grove. For further enquiries or timetable information please contact TransLink on 13 12 30 or www.translink.com.au. Services on Ferny Grove Line are cancelled due to power fault. Service to resume by 10:00 PM. Further update, services on the Ferny Grove line now to resume at 3am 10th Feb.
Further update: Services on Ferny Grove Line are cancelled due to power fault. Service to resume by 10 Feb 2009 6:14 AM. Services on Ferny Grove Line are cancelled due to power fault. Service to resume by 6:30 AM. Excuses for late running of Brisbane's CityTrain seem bizarre, slow boarding??? A MAN armed with a knife who tried to hold up a kiosk at a train station then fled on a passing train led to delays on the Airtrain service this morning. Police said that about 6.20am a man armed with a knife tried to hold up the news stand at Bowen Hills train station. The man allegedly demanded a free drink and when he was refused, he dropped the knife and jumped on a train. He is believed to have got off at Albion station and run off. Police are still looking for him. An Airtrain spokesman said an incident at Bowen Hill station just before 7am resulted in the cancellation of the 6.50am service, but all services were now running as normal. CLEVELAND line commuters should find alternative transport home with at least 90 minute delays expected on the line after an infrastructure fault. Services were halted on the busy train line about 4.50pm after a signalling fault near Cannon Hill station. Trains between Norman Park and Cannon Hill have been halted on the line, and the fault is likely to cause knock-on delays for services in other parts of the network. A spokesman for TransLink said QR crews are currently responding to the problem, She said alternative arrangement would be sought by the transport provider but commuters should be prepared to face lengthy delays. Derailment at Eagle Junction, delays all northern services. Rail services on the North Coast and Caboolture lines have been cancelled this morning, due to a signalling fault at Petrie station. Morning commuters are expected to catch a train to Lawnton and then board a bus to Narangba station, before catching a second train to Brisbane's CBD. A Translink spokesman said north-bound services had been ordered to turn around to ferry passengers to the city. The fault, which was reported just before 8am, is not expected to be fixed until after 10am. It is the second time Brisbane's CityTrain network has been thrown into disarray this week, after a train derailed at Eagle Junction station on April 6. Queensland Rail has since confirmed initial investigations into the incident showed the driver had "passed a red signal" at Eagle Junction. For more information about public transport and services phone Translink on 13 12 30. RAIL commuters have faced another horror morning on the southeast's system, with signal failures at Petrie early this morning causing havoc across the peak-hour. Trains on the heavily congested North Coast and Caboolture line had to be suspended just before 8am after signals near Petrie station failed. About 11 services that normally run through Petrie during peak hour had to be cancelled, forcing commuters on to buses between Lawnton and Narangba before returning to trains to complete their journey. The problems come on the back of a nightmare week for rail commuters, with one in six trains late on Monday. Queensland Rail electricians were able to fix the problem just after 9am. A spokesman for TransLink apologised to commuters for the incident. Ursula Heger is The Courier-Mail's transport reporter. A TRUCK has hit boom gates in Brisbane's north, stopping all trains on the Caboolture line and halting traffic. A TransLink spokesman said the accident happened about 7.20am at the Telegraph Road, Bald Hills, rail crossing. The spokesman said there were two city-bound trains waiting at Bald Hills station, and a further two waiting up the line. He said delays of about 30 minutes were expected but trains would be moving again once police were on scene to direct traffic. A Brisbane Traffic Management Centre spokesman said traffic was at a standstill in both directions and advised motorists to seek alternative routes. A truck hitting boom gates (or other incident) at the Bald Hills crossing appears to be a weekly event. Time to do something about it! Came in on a late running 6.12am ex Oxley via Tennyson due to major problems between Milton and Roma St, including one of the tunnels at Roma St. Managed to do an onboard interview with Spencer Howson 612 ABC Brisbane Breakfast. Well done QR Passenger on keeping things going as best able. We have highlighted our concerns with network reliability. Just noted another track problem now on the Cleveland line too. LATEST:TRAIN services are slowly returning to normal after a track fault near Roma Street threw the morning rush into chaos today. A Translink spokeswoman said the fault had been located - a broken bolt on the tracks in the tunnel between Roma Street and South Brisbane stations. She said commuters could still expect minor delays across the network. "It's hard to say exactly which services will be affected because so many go through Roma Street," said the spokeswoman. The Ipswich line was the worst affected by the Roma Street shut down, with commuters between Milton and Corinda suffering the longest delays. Queensland Rail's performance record this week shows almost one in six trains were delayed on Monday but that improved as the week progressed. Yesterday 87.2 per cent of trains ran on time. On the roads, the commute is not much better because of a broken down van on the Gateway Motorway approaching Old Cleveland Road near Belmont. Northbound traffic is banked back to the Pacific Motorway merge. An electrical fault affecting three main train lines this morning has been cleared but morning commuters should still expect lengthy delays. A Queensland Rail (QR) spokesman said normal services were expected to resume shortly after track crews fixed a fault in a tunnel between Roma Street and South Brisbane stations. The spokesman confirmed all trains at the city's Roma Street, Milton and South Brisbane stations were stopped after a broken bolt was discovered in the tunnel just after 5am. All trains between Milton and Corinda on the Ipswich line were stopped, while northbound trains on the Caboolture, Ferny Grove and Shorncliffe lines were also at a standstill. The spokesman said track crew had rectified the electrical fault that has caused the delays. "We are letting some trains through, but that's on an ad hoc basis," he said. Trains on the Cleveland and Beenleigh lines are moving under "special conditions'' and some trains were getting through on the Ipswich lines. A Translink spokesman said commuters should expect delays of up to 30 minutes. Construction worker Dominic Parker, who was this morning stopped on a train at Milton, said at 6.20am that his train had been late every day this week. "It's been late every day, yesterday it was late 10 minutes, the day before it was 15," he said. "I'm afraid I'm going to lose my job. "We've been stopped (at Milton) for 40 minutes now and I'm supposed to be at work on scaffolding on the Gold Coast in 20 minutes." 8:50am UPDATE: TRAIN services should be running as normal by 10am after a track fault near Roma Street threw the morning peak into chaos today. A Translink spokeswoman said the fault had been located - a broken bolt on the tracks between Roma Street and South Brisbane stations. 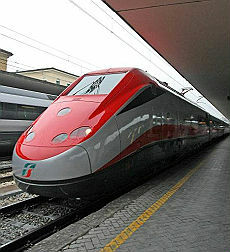 The bolt remains in place and trains were being run ``cautiously'' over it, the spokeswoman said. She said commuters could still expect 15 to 20 minute delays across the network. "It's hard to say exactly which services will be affected because so many go through Roma Street,'' said the spokeswoman. Those who did get on trains found themselves in an even tighter squeeze then normal. On the Ferny Grove line, trains were so packed commuters waiting at inner-city stations didn't even try to board. The 8:29 Mitchelton service never arrived, forcing more commuters onto the next scheduled train ten minutes later. The Ipswich line has been the worst affected by the Roma Street shut down, with commuters between Milton and Corinda suffering the longest delays. The Cleveland line was in complete chaos this morning.I normally catch the 7:17 Bowen hills service though the 7:13 doomben service didn't arrive until 7:18 Manly station staff were urging people to board the doomben service as there was a track fault at lota and the 7:17 Bowen hills had been delayed by 15mins. So i manged to find a seat on this service and by cannon hill it was a 5 on the derwan scale people were unable to board and people were shoving as the cannon hill staff were announcing 10 min delays at south bank. Just before south bank in the tunnel we stopped and were there for 10mins then at south bank we sat for 5 mins before the 8:08 [central] airport service arrived decided to run over to that train and managed to shove people out of the way onto he airport train. This train then left first and moved very slowly to south Brisbane overtaking the earlier airport train in the process which was on the down line for some reason. At south Brisbane we stopped for 5 mins and i looked out the door and saw trains banked up on all three lines the staion staff then said to go to platform 1 as the domben service would be arriving in 5 mins and be the first to leave so heaps of people left the airport and the Bowen hill train on platform 2 to go to number 1.I decided to go to the Bowen hills train on platform 2 this was the first train to leave and many people on platform 1 were giving the finger. It is time that something was done for footy shuttles. More to the point time something was done to the standards of the decaying system infrastructure that affects everyday commuter operations. Power problems on the Ferny Grove line this morning (Sunday, 17th). Buses between FG and Bowen Hills. Advice at this time is out till at least 8am. Nothing on the TransLink web site http://www.transinfo.qld.gov.au/ as of 4.55am 17th May. There is obviously something wrong with this line as this is the 3rd time this year what is going on! QR Citytrain website is now showing all services normal. Problems outbound from Roma St early this morning. Maintenance on the overhead wires at Roma St went overtime. Power restored about 5.40am. I came in on the 5.55am earlybird ex Oxley, that service ran on time. Water over the north coast line between Beerburrum and Glass House mountains. Some delays, some delays on the western line as well due to the wet weather. Nothing yet on QR or TL sites ..
All Ok now on the western line. Assume north coast now OK, no notices. There were delays on the Ferny Grove Line this evening due to an earlier medical emergency at Bowen Hills causing blocking back. Typically, the Airport train overtook the already late Mitchelton service at Central. This delay resulted in a 29 min gap for passengers travelling to stations between Windsor & Gaythorne thanks to the preceding train being an express. Yet again, this shows why running expresses on the Ferny Grove Line is a bad idea! At least the guard actually told passengers about the delay. At Mitchelton, the driver was seen running between cabs for a fast turnaround, until he run out of breath about half way along the platform! SERIOUS delays have beset the public transport network this morning, after flooding and accidents across the southeast. Delays of up to 30 minutes on the rail network began just before 5am when trains on the Ipswich line were forced to "go slow'' due to debris. The Caboolture line and the Airport line were also severely delayed after a motorist struck boom gates at Todd Rd, Lawnton. The boom gate was knocked on to the tracks, stopping both trains and cars at the crossing. Knock-on delays were caused on the Ipswich and Airport line, delaying passengers about 30 minutes. Some bus stops are currently underwater in Oxley, and diversion in place. "Some of the routes which are being temporarily diverted include routes 300/301 (Toombul) due to some flooding in that area, and 435/436 (Indooroopilly Kenmore) due to flooding at Rafting Ground Rd,'' a spokesman for TransLink said. Track damage at Ferny Grove was repaired overnight and opened at 8am this morning. All CityCat and ferry services are running slow to avoid debris in the water, and will not be on regular timetables. The Moggill ferry service has been closed. CARELESS motorists have been blasted after a single driver caused delays for thousands of commuters after crashing into boomgates north of Brisbane. Queensland Rail said the motorist had added more woe to Brisbane's already troubled transport network after hitting boomgates at the Todds Rd level crossing at Lawnton about 7.10am (AEST) today. The crash held up traffic and train services, already thrown into chaos by one of the worst floods to hit southeast Queensland in over 30 years. QR general manager Robert Moffat said careless drivers were putting lives at risk by ignoring safety warnings. "The impatience of some motorists is mind-boggling," Mr Moffat said. "People just don't seem to get it." Drivers have been told to exercise extreme caution on roads and to cancel non-essential travel where possible. On 4.38 ex Roma St stuck at Taringa ... signal failure Indooroopilly. Anticipate at least 15 minutes delay. On the move! Trains is a 5 (full! ), lucky a short delay only. a. Coal train failed at Gailes. Came in on a late running 6.11 ex Oxley (13 minutes or so late). c. Also a truck broken down on the Ipswich Motorway at Redbank/Goodna apparently. FOG and a broken-down truck have created commuter chaos on the Ipswich Motorway this morning. The semi-trailer is blocking the right-hand city-bound lane near Redbank, causing heavy congestion and long delays. A Brisbane Traffic Management Centre spokesman said traffic was banked back to the Warrego and Cunningham highways at Dinmore, and heavy delays were expected through Ipswich. The spokesman said heavy fog had created ``zero'' visibility on the Cunningham Highway at Yamanto and was also heavy through Dinmore, contributing to delays. In Brisbane, an accident between a car and motorbike has closed two lanes of Kessels Road at Lowndes St, as well as the westbound right-turn lane into Orange Grove Road. Delays should be expected on Port Drive, at Tank St, Lytton after a collision between a fuel tanker and 4WD. The accident will take some time to be cleared, as the fuel load has to be transferred to another tanker. Emergency Services said a man was taken to Wynnum Hospital with a cut foot. Fire crews will remain on scene until the tanker is decanted. There have been no reports of leaks. Traffic is being diverted away from Lang Parade, Auchenflower, due to a burst water main. Inbound traffic is advised to use Kingsford St and outbound through Roy Street. On the trains, there are delays on the Caboolture line after a car hit boom gates at the Todds Rd crossing, Lawnton. Early delays of up to 30 minutes were experienced on the Ipswich line, after a coal train stalled at Gailes about 5.45am. A TransLink spokeswoman said locomotive problems caused the breakdown, which contributed to an average 10-minute delays on inbound services between Gailes and Wacol. The spokeswoman said services had since returned to normal. LATEST: COMMUTERS continue to face delays as the CityTrain network struggles to catch-up after two incidents caused chaos this morning. Drivers and rail commuters on the northside were hit with a sense of deja-vu after a car hit boom gates at the Todds Rd crossing, Lawnton - seven days after a similar incident caused chaos. Trains on the Caboolture line are moving again but are facing delays of up to 45 minutes. The incident also caused delays to Ipswich line trains. A truck also hit a rail bridge at Muriel Avenue, Rocklea. Trains were unable to proceed on the Beenleigh line for about half an hour, while QR crews inspected the bridge for damage. Passengers faced delays of up to 30 minutes in both directions. Earlier, fog and a broken-down truck created commuter chaos on the Ipswich Motorway this morning. At 9.15am there were reports of a 44 gallon drum on the westbound lanes of the Ipswich Motorway near Stuart St at Goodna. In Brisbane, an accident between a car and motorbike has closed two lanes of Kessels Road at Lowndes St, as well as the westbound. On the trains, early delays of up to 30 minutes were experienced on the Ipswich line, after a coal train stalled at Gailes about 5.45am. Disruptions on Nambour Line between Nambour and Caboolture due to train fault. Expect 45 mins delay. Service to resume by 9:00 AM. Alt. transport operating between Nambour and Caboolture. Heavy fog blankets Brisbane's Story Bridge this morning. The eastern part of the state is under a thick blanket of fog this morning, which as halted all inbound and outbound flights at Brisbane Airport and is playing havoc with the morning commute. CityCat and ferry services were temporarily suspended this morning, but have begun running at reduced speed. Trains are also being delayed at South Bank as Queensland Rail battles an electrical fault. A power failure to signalling just south of the station has caused delays to inbound and outbound services on the Beenleigh, Gold Coast and Cleveland lines. The heavy fog, which has reduced visibility at Brisbane Airport to 420 metres, is spread as far north as Townsville and Mackay. Domestic flights have been suspended, while all incoming international flights have been diverted further north or interstate. Emirates flight EK434 has been diverted to Melbourne, Virgin Australia flight 008 from Los Angeles has been diverted to Cairns and Qantas flight 52 from Singapore has also been diverted to Cairns. Other incoming flights have been delayed by at least two hours, Brisbane Airport Corporation spokeswoman Rebecca McConochie said. "We would ask that all travellers please be patient as these conditions are out of our hands," Ms McConochie said. Bureau of Meteorology forecaster Michelle Berry said the thick fog, currently over the much of the eastern and inland parts of the state, was not expected to lift until at least 8am. "Dry westerly winds aloft have put a cap over the low level moisture supplied by the rainfall we've had in the past few days and this has cool overnight temperatures to create the thick, heavy fog," Ms Berry said. Overnight temperatures in Brisbane dropped to 14.8 degrees, while the mercury at Brisbane Airport fell to 13.4 degrees. Inland the mercury dropped to five degrees at Applethorpe at 3am. "It's difficult to put an end time on these sorts of events because it is quite a thick fog. Generally we're looking towards 8am with the fog lifting to more mist and cloud and then the mist lifting about 9.30am to cloud," Ms Berry said. Visibility on Brisbane roads has been reduced to 10 metres in some suburbs. The fog has slowed traffic on the Western Freeway and the Pacific Motorway from Springwood, the Brisbane Traffic Management Centre has reported. Northbound traffic is also heavily congested on the Gateway Motorway due to an earlier crash. Youngs Crossing Road at Petrie is closed due to flooding but is expected to be re-opened at 10am. Police have advised motorists to drive with caution and with their headlights on. There have been some problems between Darra and Indooroopilly all morning. I think teething issues with the work done over the weekend. On the move , reduced speed. VAS just announced next station as Trinder Park .... whoaa stopped just outside of Chelmer!